FILE - Earth starts to cast its shadow on the moon during a complete lunar eclipse seen from Jakarta, Indonesia, Aug. 28, 2018. If the skies are clear, the entire eclipse will be visible in North and South America, as well as Greenland, Iceland, Ireland, Great Britain, Norway, Sweden, Portugal, and the French and Spanish coasts. The rest of Europe, as well as Africa, will have partial viewing before the moon sets. 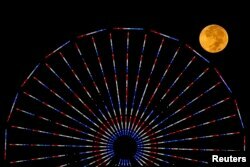 FILE - The moon is pictured behind a Ferris wheel on the pier in Santa Monica, California after a total lunar eclipse, also known as a "blood moon," Oct. 8, 2014. Parents "can keep their kids up maybe a little bit later," said, Hartigan, who will catch the lunar extravaganza from Houston. "It's just a wonderful thing for the whole family to see because it's fairly rare to have all these things kind of come together at the same time.